Philips - Air Purifier 1000: Air Purifier Review • The Air Geeks, reviews of air conditioners, dehumidifiers and air purifiers. The Philips air purifier 1000 is a strong air cleaning solution that employs highly effective technology to remove contaminants from the air in your room. This equipment is designed to remove a wide range of airborne contaminants including pollen, pet dander, house dust mites, gases, odors, and allergens. For it to work effectively, the manufacturer recommends it for small spaces. This unit is suitable for small bedrooms, study rooms, living rooms, and so on. Before purchasing an appliance, it is important to know more about its features and performance. We understand this need and that is why we have tested this air purifier and researched widely to bring you information that you can rely on. Below are the features, strengths and weaknesses of the Philips Air Purifier 1000. We will begin with its features. The Philips 1000 is a powerful air purifier that is capable of removing a wide range of airborne contaminants that could have invaded the air in your room. This air purifier features a pre-filter, a True HEPA filter and an active carbon filter. This combination helps to ensure that small to large particles in the air in your room are captured before they find their way into your nostrils. The pre-filter and True HEPA filter are designed to remove particles such as allergens, house dust mites, pollen, pet dander, and even some bacteria. The active carbon filter has real carbon particles that are capable of capturing bad smell from the air in your room. Air that passes through these filters comes out as clean, fresh, and healthy, and poses no risk to you or your family. This air purifier is highly efficient and can capture up to 99.97% of airborne particles that pass through its multi-stage filtration system, even those that are as minute as 0.3 microns in thickness. However, it is good to note that this unit does not absorb or reduce carbon monoxide gas. It is therefore advisable to maintain proper ventilation for your gas appliances. 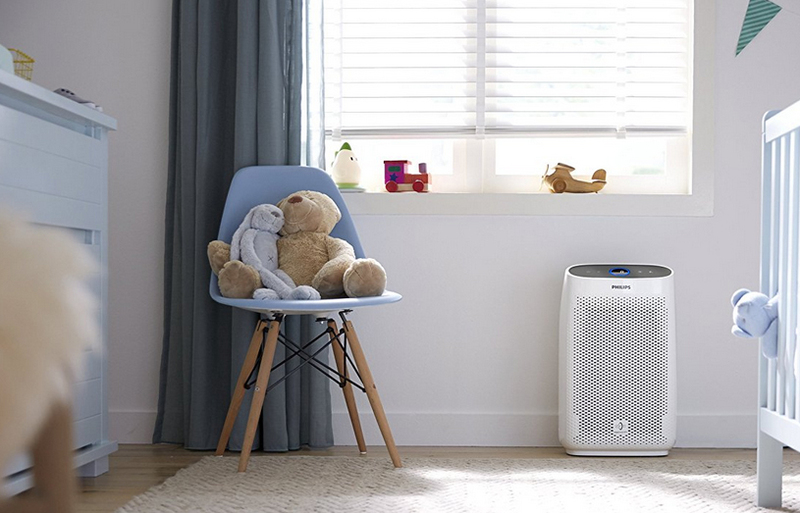 The Philips 1000 air purifier utilizes AeraSense technology to ensure that the air in your room is free from airborne contaminants. It features a professional grade air quality sensor that detects change, even the slightest, in the quality of air in your bedroom, kitchen, living room or study room. This air purifier uses the measurements obtained from this sensor to auto-adjust the fan speed to ensure that your space has fresh and clean air. You can also read the air quality data which is displayed on the dashboard of the air purifier. To deliver the performance that is demanded by your room, the Philips Air Purifier 1000 offers 3 automatic settings. These are: a general mode, an extra-sensitive allergen mode, and a Night sense mode. The night sense mode lowers light and fan speed when the room is dark. If presence of light can stop you from sleeping, then this air purifier is designed for people like you. Are you looking for a whisper quiet unit that cannot disturb you when you are sleeping? The Philips air purifier produces a whisper quiet noise when running. It is therefore a suitable choice for your bedroom, small office or any other small space that demands quietness. This air purifier allows you to adjust its settings from anywhere. Being WiFi enabled, all you need to do is connect it to your mobile device using the downloadable app. From there you can change the settings such as the fan speed or even see the lifetime of your filter. On the downside, we have observed that this feature is not highly reliable. As such, this feature can be a source of headache, especially to people who are not tech-savvy. Efficient purification – the multi-stage filtration system ensures that particles of all sizes, even those as minute as 0.3 microns, have been absorbed. Multiple air purification modes – the three modes; general, allergen, and night sense modes allow you to personalize the air cleaning process for your room. Utilizes top-notch technology – the AeraSense technology allows the unit to detect changes in the quality of air and adjust the fan speed depending on particle size. High replacement cost – we have noted that the cost of replacing filters for this air purifier can be relatively high. Problematic WiFi setup process– this process is not simple and easy, and it can be a source of headaches. Does not remove carbon monoxide – if this gas finds its way into your room, you’ll have to find alternative ways of reducing or absorbing it. It is advisable to keep your gas appliances ventilated. Just got this setup. I love how quiet it is, that it automatically speeds up if necessary, and it's got a great footprint. I took off one star because of the MISERABLE WiFi setup process. Don't install any other app than the "Air Matters." The instructions for enabling WiFi are wrong in the Phillips air filter app, and the Phillips "HealthSuite health" ("yes hello, Redundancy Dept of Redundancy speaking") doesn't even support air purifiers. Second, the other big gotcha for me was trying to connect to a 5GHz WiFi network. It worked the first time when I tried my 2.4GHz WiFi network. Might work fine if you have the same SSID for both networks, but I don't and it drove me crazy. So the hardware itself is great, and so is the software once you get it setup. I only took off one star because now you know, and knowing is half the battle. " Very quite. The filtration works well and the dust sensor is very sensitive to changes in air quality. The filter is perfect for medium or smaller rooms. There is a nice auto night-time feature but I do wish one had the option to turn that on and off. Otherwise this is an excellent air filter and I have owned a dozen different types and brands." 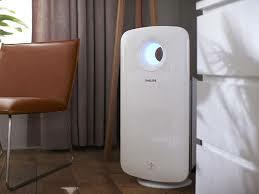 The Philips Air Purifier 1000 is a suitable air cleaning solution for small rooms and it is suitable for bedrooms, kitchens, study rooms, and so on. With a multi-stage filtration system, this unit removes up to 99.97% of particles from the air in your room, even those that are as small as 0.3 microns. It has three purification settings; general, allergen, and night sense modes from which you can choose your preference. On the downside, this air purifier does not remove some airborne contaminants carbon monoxide and the process of connecting the unit to the WiFi can be stressful. Considering its features and strengths, we highly recommend this unit. We hope that with the information we have provided you will be able to make a well informed decision.